Cover Story (view full-size image) This Issue gathers the papers presented at the 1st International Online-Conference on [...] Read more. 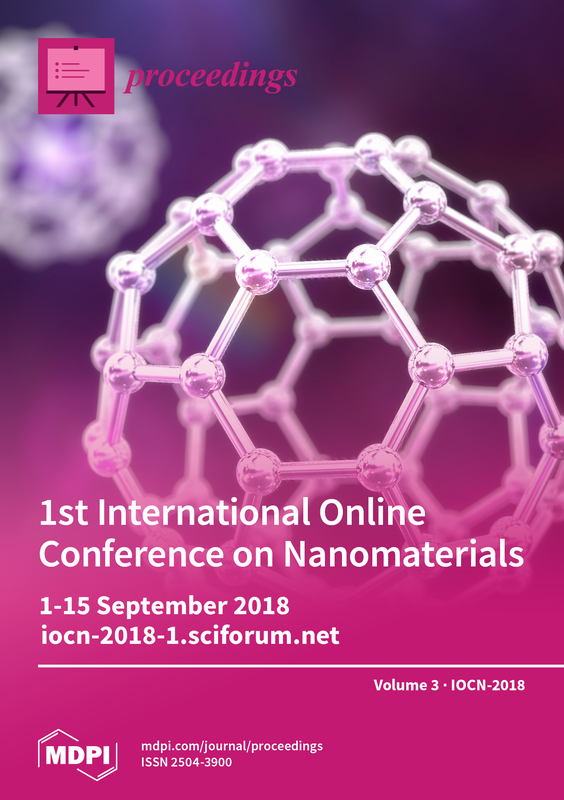 This Issue gathers the papers presented at the 1st International Online-Conference on Nanomaterials, held on 1-15 September 2018 at https://sciforum.net/conference/IOCN2018-1. The aim of this online conference was to cover the whole breadth of nanomaterials research and provide a forum for presenting and discussing new results. It collected contributions concerning the following topics: synthesis, materials, spectroscopy and microscopy, devices and energy, and biology and medicine. Synthesis of nanostructured materials is not straightforward, which involves the complicated use of surfactant templates. Currently, only non-renewable resources that are hazardous and toxic are used to produce the surfactant templates in the industries. This study presents an environmentally friendly and efficient route [...] Read more. Recent studies have expanded our understanding of the effects of nanoparticles on hydrogel mechanical properties. However, further studies are needed to validate the generality of these findings, as well as to determine the exact mechanisms behind the enhancements afforded by the incorporation of [...] Read more. In the current study, Anatase/rutile TiO2 and Anatase/rutile TiO2@Glucose composites were successfully prepared by a simple method using mechanical technique. The as-prepared composite materials powders were characterized by Powder X-ray diffraction analysis (PXRD), Scanning electronic microscopy (SEM), and Solid-state UV-visible [...] Read more. Al-SBA-15 materials were functionalized by ball milling with several niobium loadings (0.25–1 wt.%) and/or with several F- loadings, using NH4F as a precursor. The catalysts synthesized in this study were characterised by X-ray diffraction (XRD), N2 porosimetry, and diffuse reflection [...] Read more. The morphology and properties of polypropylene (PP)/organoclay nanocomposites prepared by melt processing were investigated with a special interest on the different effects of the use of different grafted PP as compatibilizers, i.e., maleic anhydride or silane-grafted species, PP-g-MA or PP-g-Si. When either PP-g-MA [...] Read more. Due to the demand for wearable and implantable microelectronic devices (MED), there is growing interest in the development of thin-film lithium-ion microbatteries (LiBs) with high-energy density. The high cost of production is an issue restraining thin-film LiBs’ wide application. Inkjet printing is a [...] Read more. Graphene oxide (GO), the oxidized form of graphene, shows unique properties, such as strong mechanical strength, high thermal conductivity, amphiphilicity, and surface functionalization capability that make it very attractive in various fields, ranging from medicine to optoelectronic devices and solar cells. However, its [...] Read more. The development of nanoscale power sources with a long battery life is now required for novel nanoelectronic devices, such as wireless sensors, biomedical implants, and smart cards. Lithiated metal oxides (Li–Me–O) are widely used in lithium-ion batteries (LIBs). Depending on the type of [...] Read more. Zirconium oxide (ZrO2) is a wide and direct band gap semiconductor used for the fabrication of optoelectronic devices. ZrO2 based optoelectronic devices span a wide optical range depending on the band gap of ZrO2 material. The band gap of [...] Read more. A polyelectrolyte complex (PEC) membrane based on sulfonated poly (ether ether ketone) and polyaniline (SPEEK-PANI) was developed for pH sensing applications. Aniline was polymerized in the presence of the SPEEK membrane by using in situ chemical oxidative polymerization to yield an ionically crosslinked [...] Read more. Thin films from double hydrophilic copolymer of complex branched structures containing poly(N,N-dimethyl acrylamide) and poly(ethylene oxide) blocks were used as humidity sensitive media, and two types of Bragg reflectors with different optical contrast and operating wavelengths were implemented as [...] Read more.